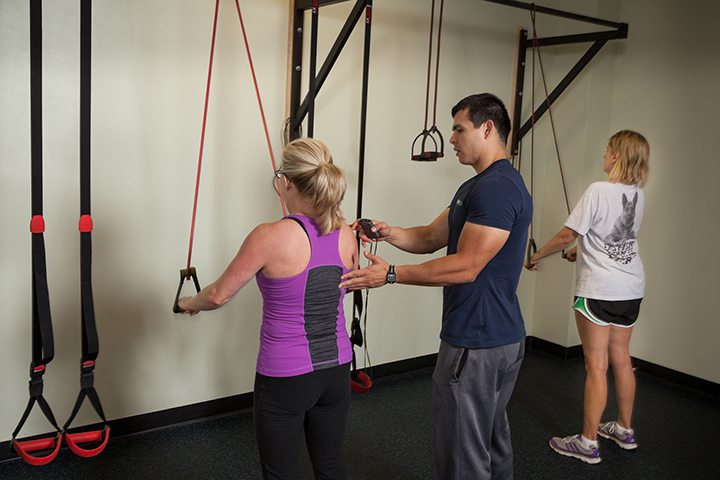 Personal training is the ultimate way of ensuring your long term fitness success. The one on one attention of our trainers brings your training to a new level and keeps you safe and sound at the same time. The training starts with a free initial consultation that assesses your goals, lifestyle, medical background, your movements, strengths and restrictions. Based on that our trainers develop a strategy that will lead you to your fitness success the fastest, and safest way. It does not matter if you have no experience in exercise or training because the training is custom designed and guides you to where you want to be. This is especially useful if you are new to training or if you want to have cutting edge training. Common accomplishments are: decreased body fat, lean muscle mass, less joint pains, improved sports performance, and overall health. Enjoy all the qualities of one on one training but work out with a friend or partner. This training will cut each of your costs by 25% and still have the one on one attention of a trainer. In semi private training you are working out with 3-4 friends. Your training is still individually designed for each one of you, but in addition to have custom training you can enjoy the motivation and support that comes from working out with friends. Working out in a group makes your training also more cost efficient. Nutrition is an integral part of any fitness transformation, regardless of your goals like, fat loss, muscle gain, performance, recovery, etc. Therefore all of our programs include a comprehensive nutrition education and nutrition plans. We strongly encourage you to take advantage of it in order to maximize your results.